Every season, Lucio Cecchinello has to face the same dilemma : keep on racing or focussing on the management of his 125cc/250cc team. His team brought him many satisfactions, but the Italian veteran remains a genuine racer after all. He thought about retiring during the season, but after a streak of good result and having considered his options, he´s now ready to spend another season in the 125cc class. ´I´m not the kind of guy who changes his mind all the time, but I´m 33, and I know I won´t be able to be racing all my life´ admits the Italian. ´However, I think the time to retire hasn´t come yet. I feel good. When I´m asked how I feel about racing against teenagers, I reply that the age doesn´t matter when you have your helmet on. There´s a lot of pressure in this job, and some difficulties can be hardly overcome without the help of good result. Anyway, I have to preserve my interest, and the interest of the team, which have to grow. The team need sponsors and tv coverage. When I look back on the 2002 campaign, I can say it has been a good year for Alex de Angelis, David Checa and Casey Stoner, but looking closer to the results, I went on the podium fifth times, and Alex only once. So the sponsors also want me to keep on riding´. So, Lucio Cecchinello is ready to take part in his ninth season in the 125cc class, racing alongside San Marino youngster Alex de Angelis. 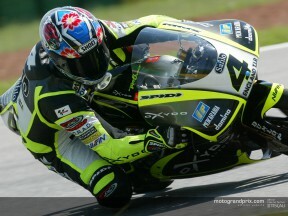 He can now head to Valencia, last round of the 2002 season. 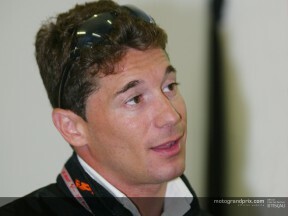 ´I like the Valencia track, the Aprilia, Gilera and Honda are on the same level there. The 125cc will be determined in this very race and a meeting will be held with Aprilia managers on Saturday, after the last qualifying session, in order to agree on a strategy to secure the title. Apart from this, my goal will be, as always, to get on the podium´.